As promised here’s the second part of my Moroccan meal. As I mentioned in Part I, I was enthralled by an article I found in Vogue Entertaining + Travel about a mother and daughter, and how cooking formed a part of their lives. It was one of those “at home” features with stories told from both the mother’s and the daughter’s perspective. Originally from Egypt (I am brimming with news about Egypt, but that’s for another post), their recipes are Moroccan, Turkish, and of course, Egyptian. I chose two Moroccan recipes for a nice dinner at home with my boyfriend, C, my brother, and his girlfriend. The main dish Chicken with Caramelized Baby Onions and Pears was good and everyone enjoyed it, but the real jackpot was the Roast Capsicums and Chickpeas with Fresh Goat’s Cheese. My brother licked the bowl clean and he is not one for salads or veggies in any shape, form, or size! – Roast capsicums in your oven (or your preferred capsicum-roasting technique) until soft and skin is black and blistered. Let cool, remove seeds and stems, peel, and then cut into wide strips. Set aside. – Drain the chickpeas/garbanzos and rinse in cold water. – Dress chickpeas/garbanzos in 2 tablespoons of the olive oil, the lemon juice, 1 of the minced garlic cloves, salt, and pepper. Taste and see if it needs more of the components, then add accordingly. – Mix capsicums and parsley into the chickpea/garbanzo mixture. Gently, you don’t want to it to become mushed. – In a separate bowl, mash the goat’s cheese with the remaining 1 minced garlic clove and 1 tablespoon olive oil. Taste and see if it needs extra garlic. I probably tossed in half a clove extra. 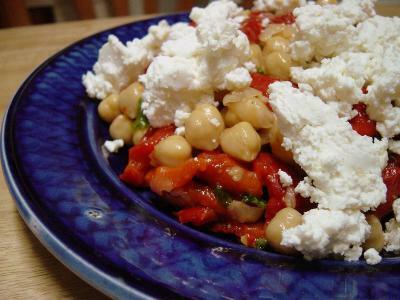 – Crumble the goat’s cheese mixture on top on the chickpea/garbanzo and capsicum (which you have arranged on a lovely platter beforehand). This was excellent and had all four of us fighting over the last dregs and licking the platter clean. It’s so simple and yields such great results. The flavors melded and complemented each other perfectly: the sweetness of the capsicums, with the chickpeas’ yielding firmness and nutty/beany flavor, and the garlic kick…all strung seamlessly together by the simple, classic dressing of extra virgin olive oil, lemon juice, salt, and pepper. Yum! Note: Next time I will roast more capsicums and place the extra ones in a jar, with some extra virgin olive oil and minced garlic, and keep it on hand to make it even easier to whip this up in a flash. What a vibrant picture — it just leaps off the page! I’m a baker myself, so I’d never really try anything like this, but I appreciate people who do.